An estimated one million babies die each year from prematurity and respiratory issues; and respiratory problems remain one of the leading causes of death for children under the age of five. Two Western Michigan University students aim to reduce these staggering statistics with NeoVent, a noninvasive positive pressure ventilation system that was recently awarded the 2015 James Dyson Award for the United States. For those of us lacking in experience in the healthcare field, NeoVent will help treat premature infants who are having difficulty breathing and can be used as an affordable and accessible breathing aid in developing countries. Whereas existing ventilation systems can run up to $25,000, NeoVent’s estimated $25 cost could greatly increase its use and availability in rural, isolated, and poor communities. Preemies and infants with respiratory distress need positive pressure therapy to help them regain their breathing, a process which often involves the use of a bubble CPAP (Continuous Positive Airway Pressure) circuit, a low-cost breathing aid. 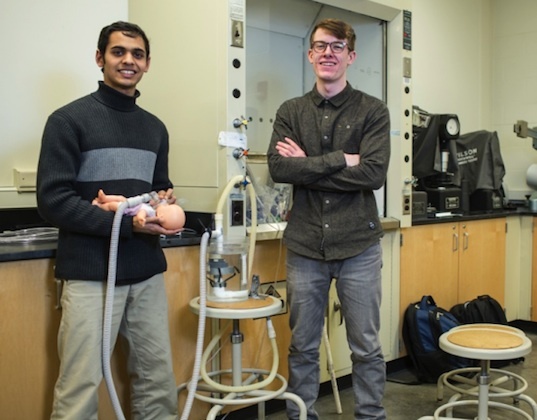 Joseph Barnett and Stephen John were inspired to create an affordable, low-energy, Noninvasive Positive Pressure Ventilation for more severe cases of respiratory distress after a Respiratory Therapist told them of the need for a simple, dual-pressure mechanism. Dozens of prototypes later, John and Barnett created NeoVent, which will be tested in Nepal, Uganda, and Kenya, and which was designed with the idea that its primary users would be busy nurses who would lack the specific training of a Respiratory Therapist. With only one moving piece, the NeoVent industriously uses the the waste energy of a CPAP machine, doesn’t need batteries or additional power supplies, and can easily be swapped in to an existing CPAP system. Changing the water levels allows for the adjustment of pressure levels, and nurses or health personnel can verify if NeoVent is delivering positive pressure to the infants simply by checking for the existence of bubbles and the up-and-down movement of the ventilation system in the water. NeoVent was designed with infants in mind, but we can all breathe easier knowing that this innovative ventilation system could save untold lives in developing countries. An estimated one million babies die each year from prematurity and respiratory issues; and respiratory problems remain one of the leading causes of death for children under the age of five. 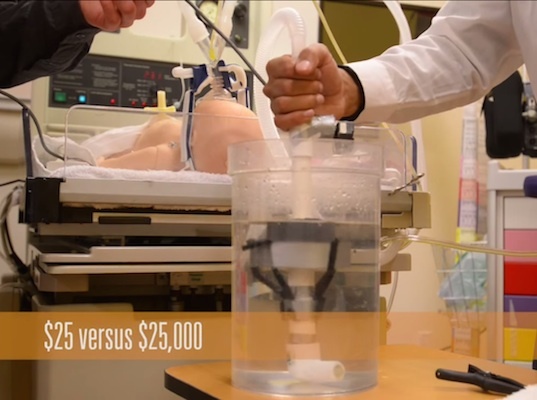 Two Western Michigan University students aim to reduce these staggering statistics with NeoVent, a noninvasive positive pressure ventilation system that was recently awarded the 2015 James Dyson Award for the United States. For those of us lacking in experience in the healthcare field, NeoVent will help treat premature infants who are having difficulty breathing and can be used as an affordable and accessible breathing aid in developing countries. Whereas existing ventilation systems can run up to $25,000, NeoVent's estimated $25 cost could greatly increase its use and availability in�rural, isolated, and poor communities.